1 May 2008, at 10:31a.m. UK - Suffolk farmer Mick Binder, who has been producing Christmas turkeys for more than 20 years, is the new chairman of the Traditional Farmfresh Turkey Association (TFTA). Mr Binder, of Rumburgh, near Halesworth, succeeds Essex turkey producer Jane Haigh who has been chairman for the past two years. Originally from Essex where he farmed in partnership with his father and brothers, Mr Binder emigrated to farm in Western Australia in 1979 producing wheat and sheep north of Perth. 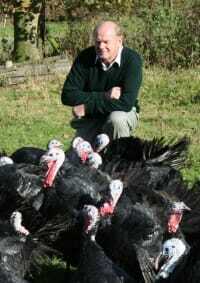 He returned to the UK in 1987 to farm at Rumburgh specialising in turkey production - with the initial 100 Norfolk Blacks for the first Christmas expanding now to around 10,000 mostly free range bronze. He sells turkeys to farmgate and butcher customers under the TFTA's Golden Promise label - the first UK brand to gain a EU food mark for traditional speciality products. One of his main goals will be promoting the difference between this product and other Christmas turkeys. "Our members produce turkeys that are grown slowly to full maturity, then dry plucked and hung for at least seven to ten days to achieve the flavour and texture associated with a premium traditional turkey," says Mr Binder. "That's not something you can do on a large scale for the mass market. We and our butcher customers need to make consumers understand the emphasis on quality that's enabled Golden Promise - like some of Europe's other prestige food products - to gain EU recognition." The new vice chairman is Robert Garner who produces 3000 free range bronze turkeys at Godwick Hall, Tittleshall, in Norfolk. He looks after the turkeys and arable production while his father John tends their prize-winning herd of pedigree Suffolk sheep. Mr Garner joined the TFTA four years ago and says the brand has boosted consumer confidence in his product, enabling him to expand direct sales.